Here’s another fine addition to the box collection, this time a small one (3″ x 1 7/8″). 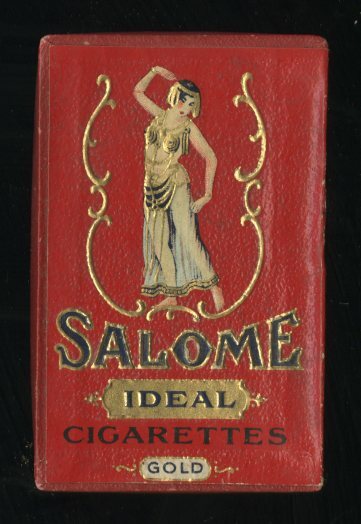 The brand was called “Salome”, after the biblical temptress of the same name. The original Salome was the daughter of Herodias (AD 14-72). The story of her seductive “dance of the seven veils” before King Herod was covered by Gospel writers Mark and Matthew. Apparently Herod was so taken with her belly dancing that he offered her anything that she wanted in the world. Salome, not shy in her demands, required the head of St. John the Baptist. She kissed it when it was presented to her. As far as I know, this box represents Salome’s first advertising gig. The package design is really quite bold. The deep red paper has a leather-like finish and is deeply embossed with the graphics. The cigarettes themselves (not present), were small, scented and said to have a “Gold Tip”. The Rosedor Cigarette Company, of Brooklyn, obviously spared no expense in positioning this as a premium brand. This particular box is from 1924 and I can imagine “flappers” carrying these in their purses for a night out. A 1914 advertising poster (shown below, designed by Emil Cardinaux) boldly depicts “Jean Sessler & Company” as the maker of the product, so it is possible that they developed the brand. The Sessler company was aligned with American Tobacco. But take another look at that poster, a masterpiece in itself: it describes the product as “cigarettes orientales” while the graphics include two Egyptian style pillars. The tie to Egypt and the “orient” was common, as we’ve seen with other brands of the period. However, the poster does not quite fit comfortably into the Art Nouveau style so prevalent at the time (from around 1890 to 1920). Instead it appears to anticipate elements of the coming Art Deco movement. 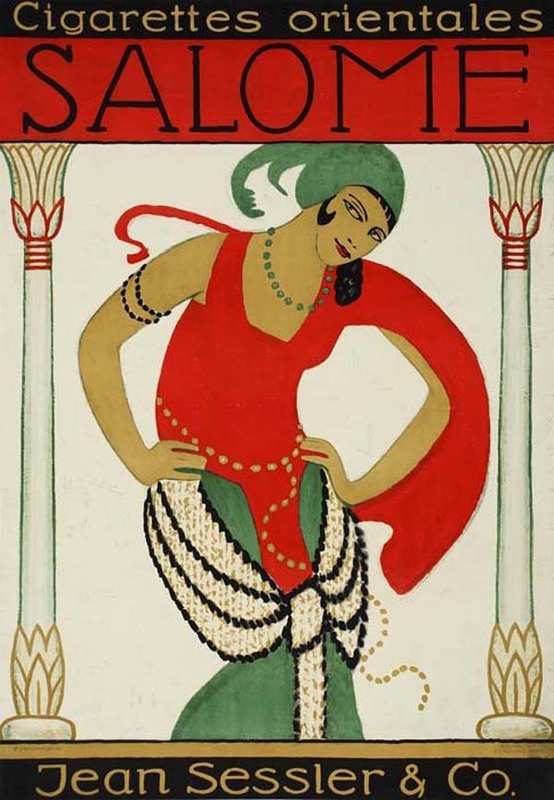 The poster designer, Emil Cardinaux, was one of the most sought after designers of the time. It was his 1908 masterpiece, Matterhorn, that launched the modern era of travel posters. Anyway, I’m glad that I picked the box up!